What's the word for "wow!" in every language? Well that's what I have to say about Harris Eisenstadt's latest release, September Trio (Clean Feed). The Canadian born Brooklyn transplant has delivered his second record for 2011 and its even more striking than Canada Day II. This time, as a trio under the aforementioned title. Opening with the repetitive, melodic blues of "September 1," Eisenstadt sets the tone that this is a much different outing than Canada Day. "September 1" has you focused on the trio's interactions and the complex and free flowing nature of Eisenstadt's compositions. It's improvised but held within a tight dynamic. This may not have been achievable in any other setting than a trio. Eskelin has a muscular tone in his phrasing which reminds me of of Ornette Coleman, while Sanchez continues to show why she deserves much wider recognition. Her agile, rhythmic yet contemplative performance has really started me to put her on the same level as Kris Davis, John Escreet, Jason Moran, Sylvie Courvoisier and Irene Schweizer. A real creative at the piano. But the real focus is Eisenstadt's compositional work. On September Trio he has allowed his fellow musicians the freedom to move in various directions and in addition, his own timing and melodic touches are exquisite and thoughtful. 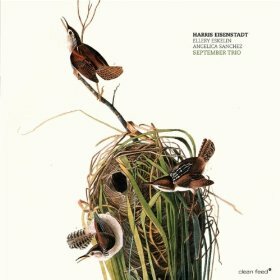 There is a moment about 2/3's of the way into "September 1" where Eskelin and Eisenstadt share some raw improvised exchanges but it will be the soft tones of Eisenstadt's brushes that you may focus in on as they are placed just under the melody. Beautiful. "September 3," Eisenstadt allows Sanchez and Eskelin to paint a wonderful picture in cascading hues and a well placed use of space. The piece is superbly written and has moments "harmolodics" throughout. Eisenstadt remains settled into the background with steady timing until midway through when the trio begin to interweave and almost become one note of improvisation. "September 6" starts of with a rich and bellowing solo period from Eskelin and then slowly turns into a haunting blues filled with counterpoints and lots stellar exchanges between the musicians. "September 6" while moving in various directions still displays as sense of order and investigation. The final three minute passage is spectacular as it rises in tone and then quietly descends into black. Harris Eisenstadt has already established himself as one of most sought after drummers in the jazz community but its his writing that's really becoming more significant. The ability to write material with such breath while allowing your fellow musicians a majority of the spotlight yet still producing some excellent moments of your own, is well, nothing short of phenomenal. September Trio should be the album that finally sets Harris Eisenstadt apart from many of his peers, as a performer and a writer. Album of the year material for sure. Highly Recommended and Unexpectedly Beautiful.